We would love to have your family a part of the First Presbyterian Preschool community! We are committed to providing your child with an engaging, play-based education that will have them loving learning right from the start. All our welcome! Open enrollment begins on February 2 - don't forget to stop by our Open House to learn all about the preschool! When you've finished applying, be sure to click HERE to finalize the process with your deposit. *enrollment is currently full for all of our AM classes, but we would love to have you in our PM classes! "Miss Haley sets a warm, positive environment in her classroom. Students know the expectations and that she truly cares for them. Miss Haley values each student and in turn they value each other. Her calm and positive demeanor are such an asset in her teaching!" "Our son has made many friendships and has had a wonderful first school experience. This has made him an eager learner and allowed him to be excited for kindergarten!" We had a fabulous day at the DeGraaf Nature Center with cookies from Holland Cakery, photos with Santa from Elyn Marie Photography, coffee from Ferris Coffee, coloring pages from Lucas Marsman Tattoo and all of our financial sponsors whose generosity will provide scholarships, supplies for the classroom, and support for our amazing teachers. Thank you FPP Community for such a fun event! 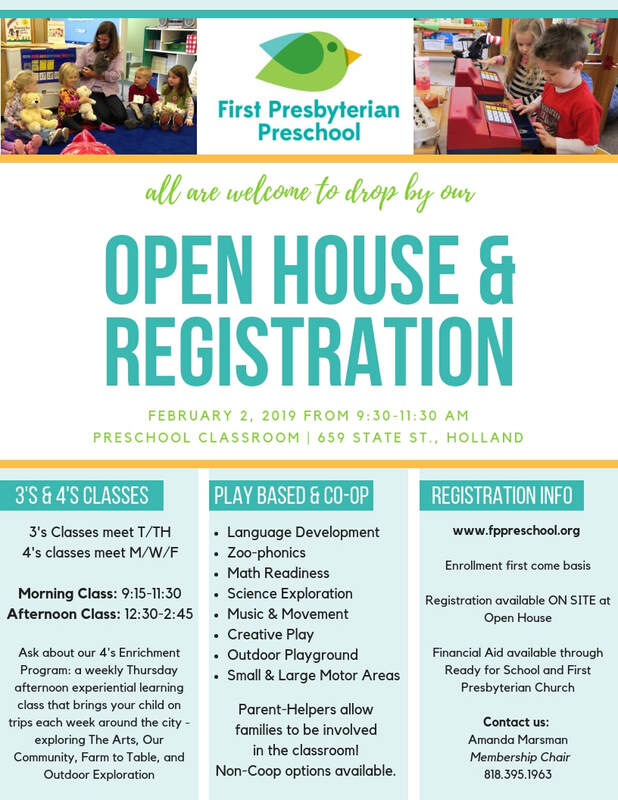 First Presbyterian Preschool in Holland, MI strives to provide an environment in which a child explores his or her own capabilities. We facilitate the child’s natural curiosity and wonder about God’s world through play. Preschool Promo from Abbie Telgenhof on Vimeo. For 4 year old students, we have been able to set aside some money from our fundraisers, First Presbyterian Outreach Council and Presbyterian Women to enable us to provide some tuition assistance. Read more about it here!